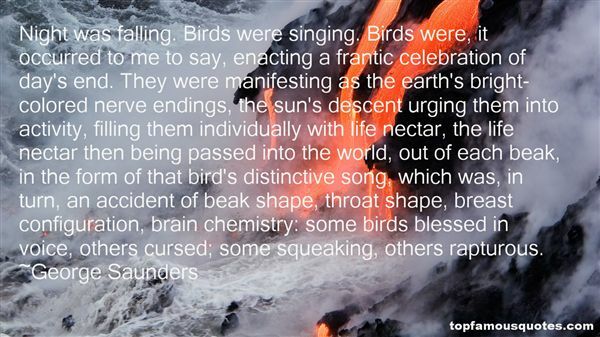 Reading and share top 14 famous quotes and sayings about Singing Birds by famous authors and people. 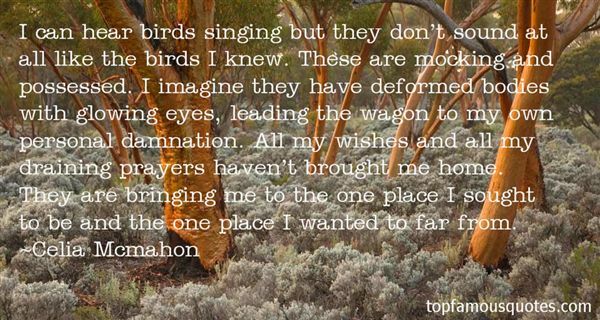 Browse top 14 famous quotes and sayings about Singing Birds by most favorite authors. 1. "When sad she brings the thunderAnd her tears, they bring the rainWhen ill she feeds a poisonTo us all to fell her painHer smiles they bring the sunshineAnd the laughter and the windAnd the birds they go on singingAnd the world is whole again. "Smile, sweet Sunday," Wednesday whispered in her ear. "The birds need your love so they can lift their wings." 2. "For lo, the winter is past, the rain is over and gone; the flowers appear on the earth: the time of the singing of birds is come, and the voice of the turtle is heard in our land." 3. "I can hear birds singing but they don't sound at all like the birds I knew. These are mocking and possessed. I imagine they have deformed bodies with glowing eyes, leading the wagon to my own personal damnation. All my wishes and all my draining prayers haven't brought me home. They are bringing me to the one place I sought to be and the one place I wanted to far from." 4. "Little WordsWhen you are gone, there is nor bloom nor leaf,Nor singing sea at night, nor silver birds;And I can only stare, and shape my griefIn little words.I cannot conjure loveliness, to drownThe bitter woe that racks my cords apart.The weary pen that sets my sorrow downFeeds at my heart.There is no mercy in the shifting year,No beauty wraps me tenderly about.I turn to little words- so you, my dear,Can spell them out." 5. "Verse is the natural speech of men, as singing is of birds'The Week's Survey, 18 June 1904"
6. "Night was falling. Birds were singing. Birds were, it occurred to me to say, enacting a frantic celebration of day's end. They were manifesting as the earth's bright-colored nerve endings, the sun's descent urging them into activity, filling them individually with life nectar, the life nectar then being passed into the world, out of each beak, in the form of that bird's distinctive song, which was, in turn, an accident of beak shape, throat shape, breast configuration, brain chemistry: some birds blessed in voice, others cursed; some squeaking, others rapturous." 7. 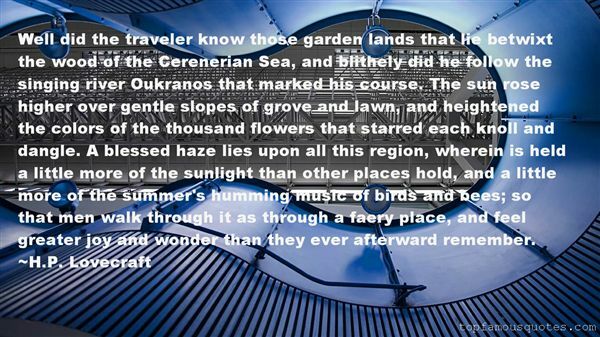 "Well did the traveler know those garden lands that lie betwixt the wood of the Cerenerian Sea, and blithely did he follow the singing river Oukranos that marked his course. The sun rose higher over gentle slopes of grove and lawn, and heightened the colors of the thousand flowers that starred each knoll and dangle. A blessed haze lies upon all this region, wherein is held a little more of the sunlight than other places hold, and a little more of the summer's humming music of birds and bees; so that men walk through it as through a faery place, and feel greater joy and wonder than they ever afterward remember." 8. "As I love nature, as I love singing birds...I love thee, my friend." 9. "Pass not beneath, O Caravan, or pass not singing. Have you heardThat silence where the birds are dead yet something pipeth like a bird?" 10. "Let me guess - you're Grumpy? 'He let out a humpf. ' And you would be too, if you'd just spent the last hour searching the forest for your wayward charge.' He walked even faster. 'We tell you to stay inside, we tell you not to talk to strangers. But oh no, you must be out singing to the animals as if the birds didn't do a fine enough job of it. And this after Queen Neferia has already tried to kill you thrice. [...] Which is why you are not to go shopping anymore, no matter how pretty the wares, remember? 'Oh, right.' [...] when you looked at it that way, Snow White had to be pretty idiotic to keep falling for the same trick." 11. "On the Gallows OnceKofi AwoonorI crossed quite a fewof your rivers, my gods,into this plain where thirst reignsI heard the cry of mournersthe long cooing of the African wren at duskthe laughter of the children at dawnhad long ceasednight comes fast in our landwhere indeed are the promised vistasthe open fields, blue skies, the singing birdsand abiding love?History records actsof heroism, barbarismof some who had powerand abused it massivelyof some whose progenitorsplanned for themthe secure state of madnessfrom which no storm can shake them;of some who took the last shipsdisembarked on some far-off shores and forgotof some who simply laid down the loadand went home to the ancestors"
12. "Before I fellin love with words,with setting skies and singing birds -it was you I fellin love with first." 13. "Those hours given over to basking in the glow of an imaginedfuture, of being carried away in streams of promise by a love ora passion so strong that one felt altered forever and convincedthat even the smallest particle of the surrounding world wascharged with purpose of impossible grandeur; ah, yes, andone would look up into the trees and be thrilled by the wind-loosened river of pale, gold foliage cascading down and by thehigh, melodious singing of countless birds; those moments, somany and so long ago, still come back, but briefly, like firefliesin the perfumed heat of summer night." 14. "What is more cheerful, now, in the fall of the year, than an open-wood-fire? Do you hear those little chirps and twitters coming out of that piece of apple-wood? Those are the ghosts of the robins and blue-birds that sang upon the bough when it was in blossom last Spring. In Summer whole flocks of them come fluttering about the fruit-trees under the window: so I have singing birds all the year round." Our bodies need regular washing because we get dirty everyday. But so do our hearts! Because each day, people hurt us, offend us, forget us, snub us, step on us, reject us. But if we choose to forgive everyone everyday, we cleanse our hearts! We wake up the next morning refreshed and pure and lovely!"